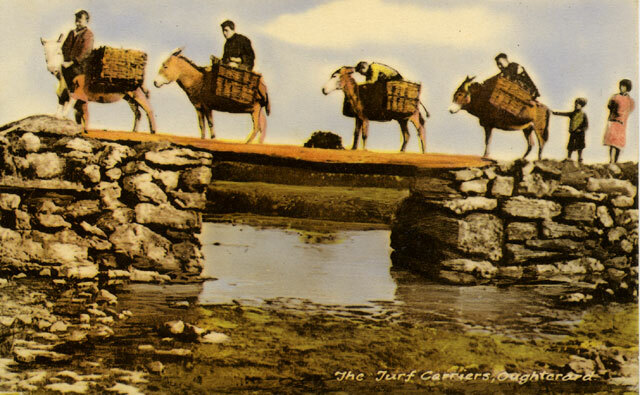 The Irish peasant traveled from his/her home to the bogs to harvest peat and to town to sell and buy animals at the fairs. 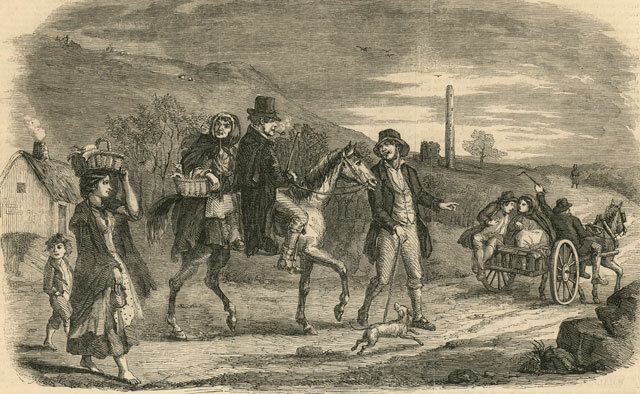 Many men also traveled seasonally to England and Scotland to harvest crops and earn better wages than they could in Ireland. 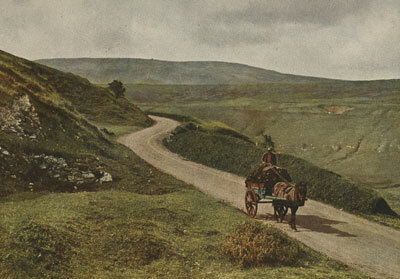 As the picture above indicates there were sometimes significant distances between the cottage and town. 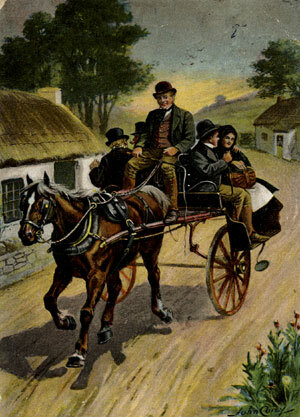 The most common way to get around was probably on foot. 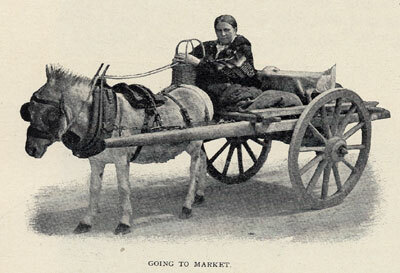 Other means were: boat, horse, donkey, and various kinds of "cars". 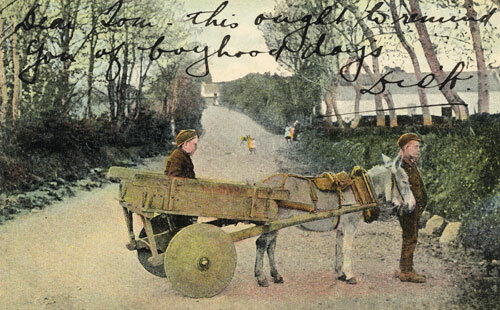 The railroad came to Ballinrobe, Co Mayo in 1892. 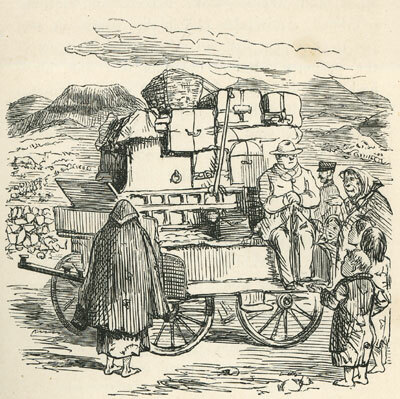 There are numerous images of the Irish walking: to market, to church, to emigrate. 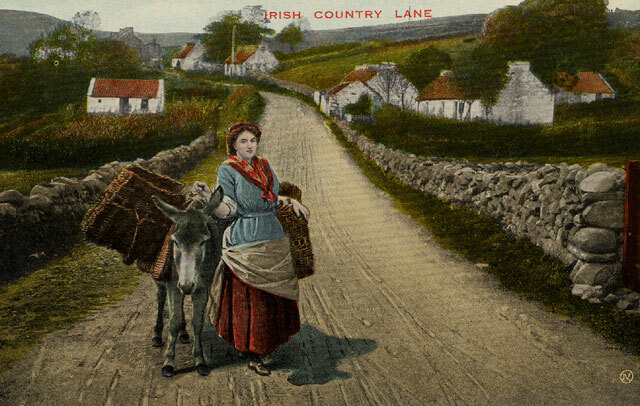 The rock walls in this images are very similar to those around the townland of Mohorra (the birth place of Maggie Langan Walsh and her mother, Penelope Byrne). 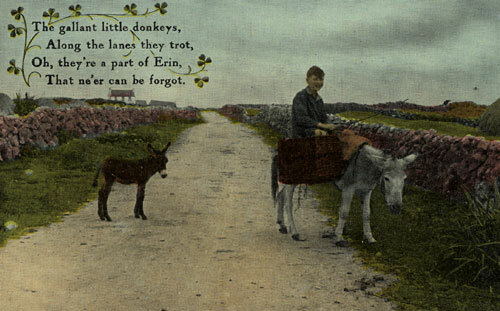 In addition, the spacing of the houses is similar to that of the houses around the Byrne Cottage in Mohorra, Shrule Parish. 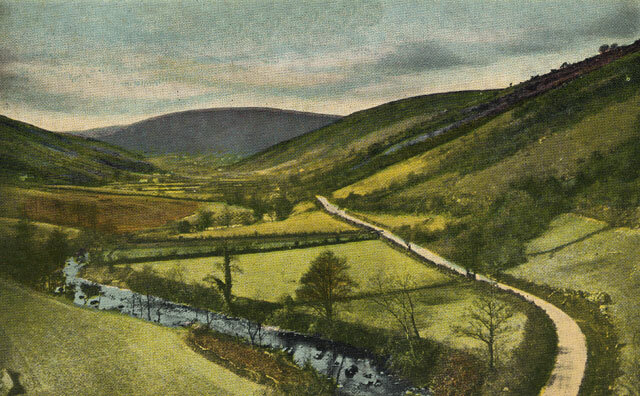 The main difference is that the area in Shrule parish is less hilly than that portrayed in this picture. 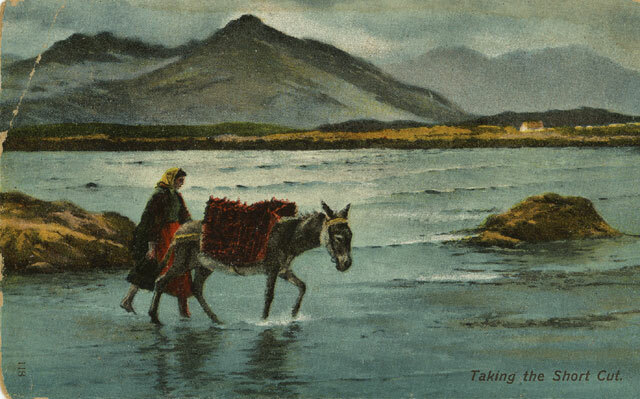 There are many lakes in South West Mayo and Galway. 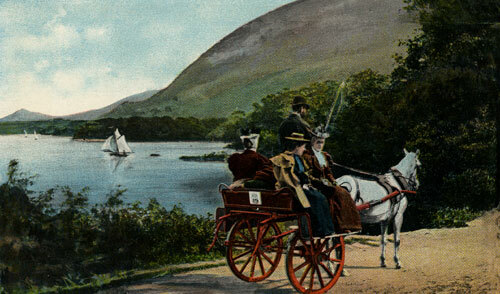 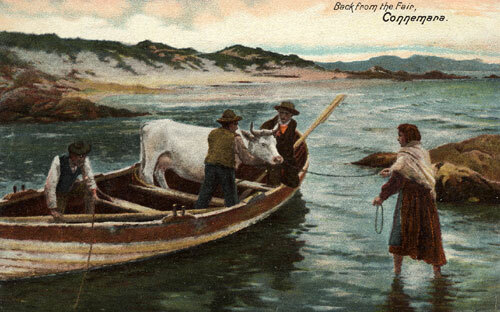 While this postcard is from "Connemara" similar means of transportation were used on Loughs Mask and Corrib near Ballinrobe and Shrule.
" 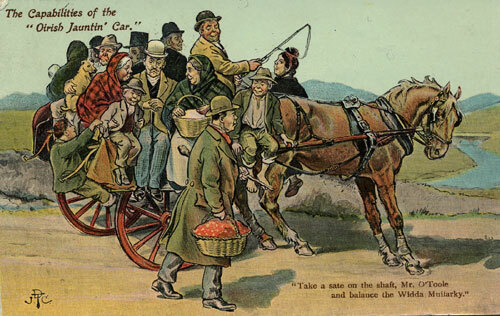 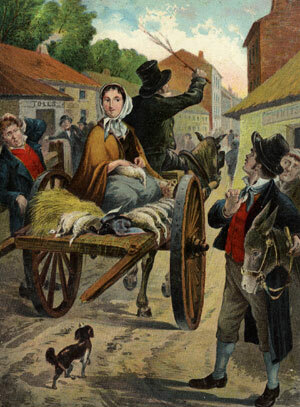 what we would call a "jaunting car" was used by my mother's family for going to mass etc, but she called a "back-to-back" for obvious reasons". 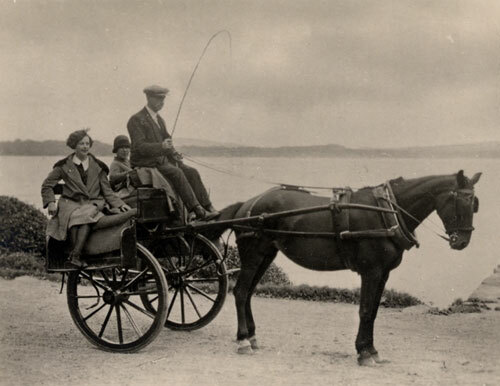 "Jaunting Car, Ireland- The jaunting car used in Ireland somewhat resembles our "dog cart" with the exception that it is not as high and carried four passengers with a driver instead of two. 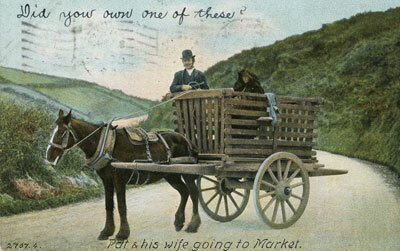 The passengers are seated sidewise, as may be seen from the picture." 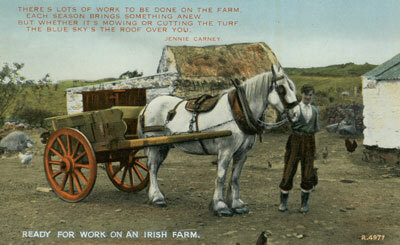 "The Capabilities of the "Oirish Jauntin' Car"
Date unknown, however, the clothes suggest the 1930s. 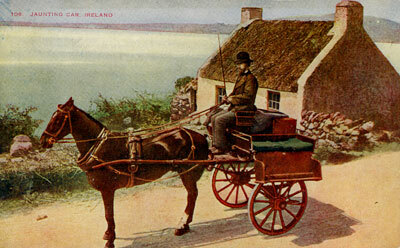 "Touring on an Irish jaunting car"
In the Hollywood movie, Captain Boycott, Stewart Granger plays an Irish peasant with a love of fast riding horses. 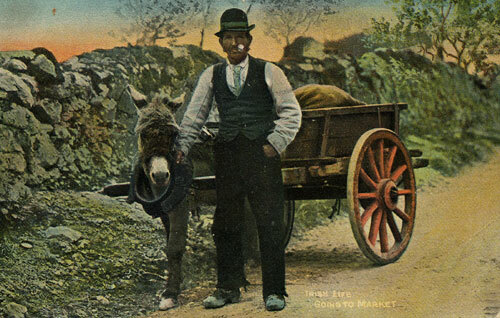 Captain Boycott was a Mayo Landlord and the Boycott portrayal in the movie, Captain Boycott, is pretty true to the story. 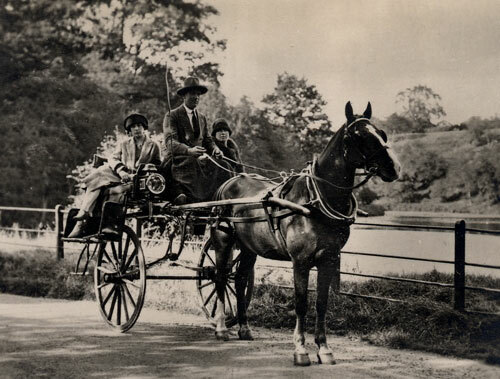 Captain Boycott himself was a good rider who liked to race horses. 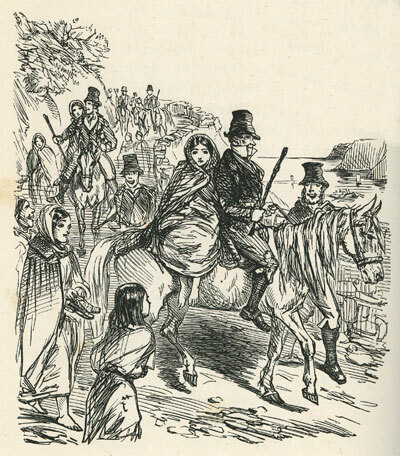 Saddles did not seem to be known, and the bridles, chiefly, were of rope and twisted hay. 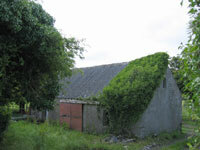 To see photos of the Byrne cottage in Mohorra, Shrule Parish, click on the cottage.